Blastomycosis in Dogs: What is the Best Drug Treatment? Blastomycosis is a fungal infection that is being seen more commonly in our pet population, with dogs being more commonly infected than cats. Blastomyces dermatitidis, a dimorphic fungal organism, is the causative agent and is most commonly seen in the Ohio, Mississippi, and Missouri River Valleys, as well as mid-Atlantic states. Infection is caused by inhalation of spores that settle in terminal airways as well as inoculation of wounds. Once infection is established, the organism is disseminated via lymphatics to distant organs such as the eyes, brain, lymph node, nares, and brain. Clinical signs are variable based on the location of infection/dissemination and can include anorexia, weight loss, respiratory signs (85%), ocular disease (40%), lameness from bone involvement (30%), and dermal lesions (20-30%). Diagnosis is based on a combination of clinical signs, radiographic changes, serology, urine antigen testing, and direct visualization of the organism via cytology or biopsy. Figure 1. 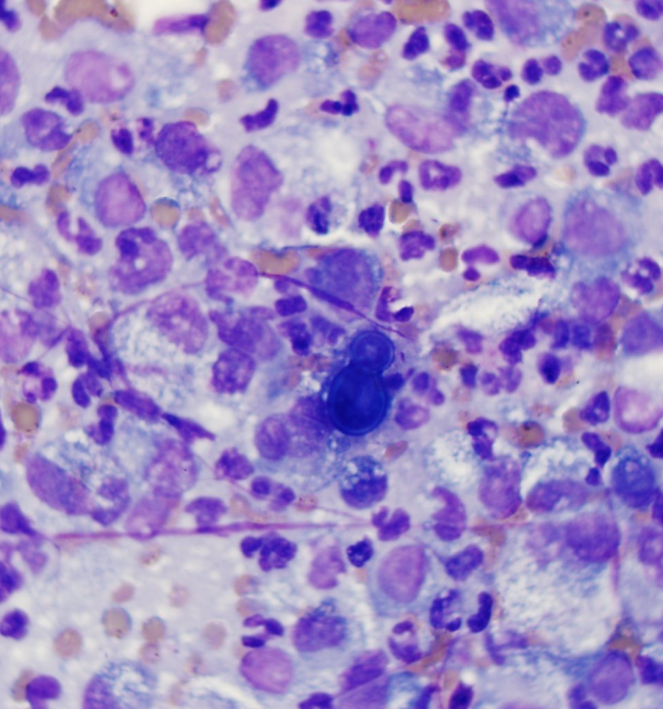 Blastomyces dermatitidis identified on cytological evaluation of an endotracheal wash.
Once diagnosed, treatment with antifungal medications is integral to elimination of active infection. Although Amphotericin B can be used in more advanced disease, azole based antifungals have become the mainstay in treating the majority of fungal infections. Although itraconazole has been considered the treatment of choice for blastomycosis, a 2011 study of 144 dogs found that there was not a significant difference in relapse rates or treatment response. Additionally, there was not a significance increase in toxicity characterized by an increased ALT in the fluconazole group. Although the treatment duration was longer in the fluconazole treated group, remission was obtained in 75% of those patients. Finally, there was a significant cost savings to the clients using fluconazole over itraconazole. Although each case must be individually assessed, fluconazole may be viable a alternative to itraconazole resulting in cost savings to the client along with a comparable prognosis. J Vet Intern Med. Mazepa AS, Trepanier LA, Foy DS. Retrospective comparison of the efficacy of fluconazole or itraconazole for the treatment of systemic blastomycosis in dogs.2011 May-Jun;25(3):440-5.